Access the web application accompanying our publication Next-generation reference intervals for pediatric hematology. Laboratory tests are an important tool for health assessment and essential for the majority of diagnostic and therapeutic decisions in modern healthcare. To enable the interpretation of numerical laboratory test results, comparison to reference intervals is performed, i.e. values expected in a comparable group of healthy control persons. When evaluating children’s laboratory test results, complex dynamics due to extensive physiological change with age have to be considered – however, lack of comprehensive reference intervals reflecting these dynamics limits the usefulness of laboratory tests in children and negatively impacts pediatric healthcare. 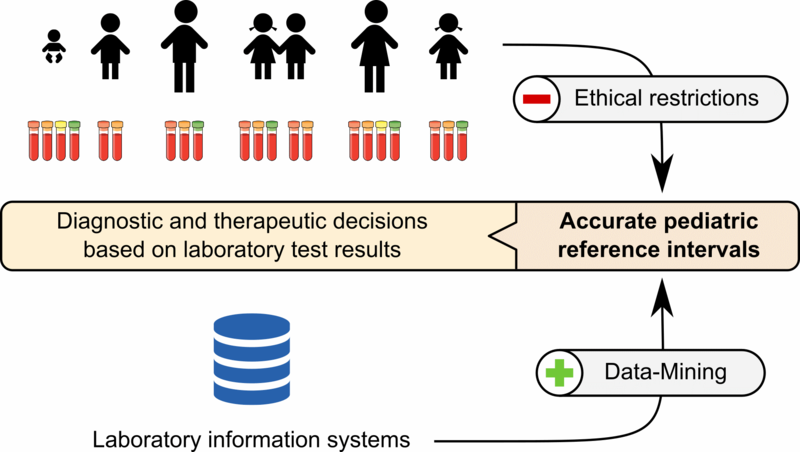 In the PEDREF study, we have established an approach to create pediatric reference intervals using data-mining of laboratory information systems, which circumvents the ethical and practical challenges of conventional approaches and enables the interpretation of laboratory test results in children with unprecedented accuracy. Figure 1: Accurate pediatric reference intervals are essential when clinical decisions are guided by laboratory test results. However, ethical and practical restrictions limit the creation of accurate pediatric reference intervals using conventional approaches. Data-mining of laboratory information systems overcomes these restrictions and allows the construction of accurate pediatric reference intervals. The PEDREF pediatric reference intervals initiative is a multi-center study led by Markus Metzler, Manfred Rauh and Jakob Zierk at the Department of Pediatrics, University Hospital Erlangen and supported by the DGKL's Working Group on Guide Limits. The dataset analyzed in the PEDREF study is a collaborative database from 12 German tertiary care centers and laboratory service providers, containing > 15,000,000 samples from children aged 0 to 18 years. See the complete list of collaborators. The quality of the created reference intervals increases with the number of samples available for analysis, and datasets from varying sources allow us to establish reference intervals for different analytical platforms and populations. Therefore, we are always looking for collaborators prepared to share anonymized data-sets. Contact us if you have questions or are interested in joining the PEDREF study. A collaborative pediatric reference intervals initiative of the Department of Pediatrics, University Hospital Erlangen and our collaborators supported by the DGKL's Working Group on Guide Limits.